Hi from Germany! Sorry I have been M.I.A on here but I have been getting ready for our Euro Trip (so excited)!! I wrote this while at the Germany airport on layover and I have to say... this is one gorgeous airport! Everything is so pretty here & the coffee and food is so yummy! Stay tuned on my Instagram to see where our first stop on our trip is! Now about this gorgeous lace top... I am in LOVE! 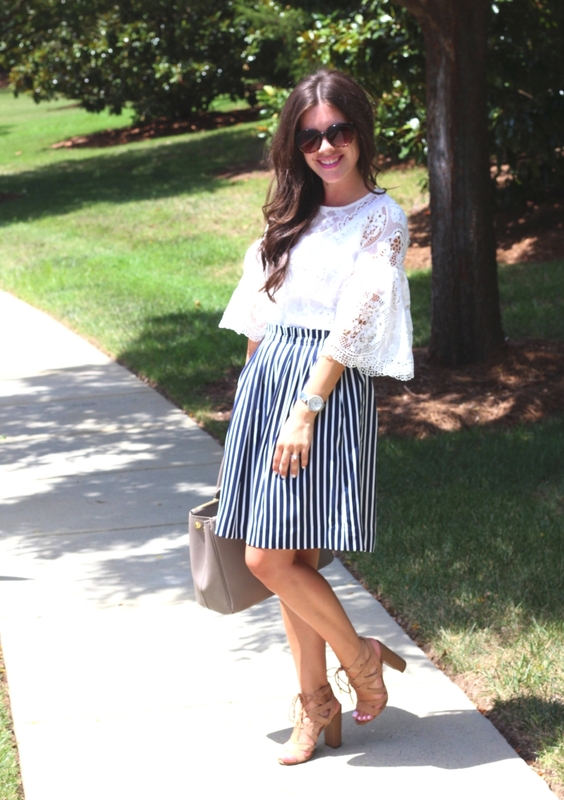 I love anything feminine, lace, and bell sleeves and this is best of all those worlds! Plus, it can be worn so many different ways. Also, SALE ALERT! I got THIS top and THIS top from the same site I got this lace top and they are both 50% off. You can see how styled them on my recent Instagram posts! Hope you all are having a great week so far! XO! Hi! Hope you're all having a great weekend! I started working on this post yesterday, and I ran out of time so I decided to finish it and post it on a Saturday instead of cutting it short just to get it posted on Friday. So with that said.. let's finish our Saturday with a Friday Five haha! My husband and I are taking a condensed trip to Europe next week! I wanted to do a detailed travel post with five different packing categories and tips on how to pack smart. I am the queen of overpacking and throwing everything I think I will need, but always end up packing a bunch of things I don't use and wishing I had packed something I didn't. I have done a bit of research, mostly on Pinterest (you can see my Packing Tips pin board here) and have gotten some great tips from you all on Instagram (thank you!) so I will be sharing my favorites here. My biggest weakness traveling is packing clothes. I always throw in my favorite clothes but never really paid attention to what I added until I weighed the suitcase realizing I had way too many things in there, but could not figure out what to take out. Knowing that I have to pack two weeks worth of clothes in fairly 40 lbs I knew I had to pack smart. I laid out all of my favorites, and put them together to create outfits. Most everything that did not match with more than one thing I put to the side to add if there was any room left. The weather is nice and warm during the day but chilly at night, so I packed this green cargo jacket (similar HERE) & this grey cardigan because they both go with almost every outfit and can easily be thrown over a 'summer' outfit while still looking cute. I also packed a few dresses (THIS one pictured is my fave!) because they are lightweight and are just one item to create an outfit whereas a top, cami, and pants are more items adding to weight and still only create one outfit. Plus, I love dresses to travel around a city in because they are comfortable and cute. Sidenote on the tops and pants comment.... they are multiple items adding to weight but they can be mixed & matched so just make sure you create outfits but have a backup plan if something gets dirty. For example don't pack say six tops and two pants to mix and match... If you get one pant dirty the first of your days you're stuck with only one more. The second part of outfit packing is the shoes. I wish I could pack all my shoes and wear different ones with different outfits but they are way too heavy. 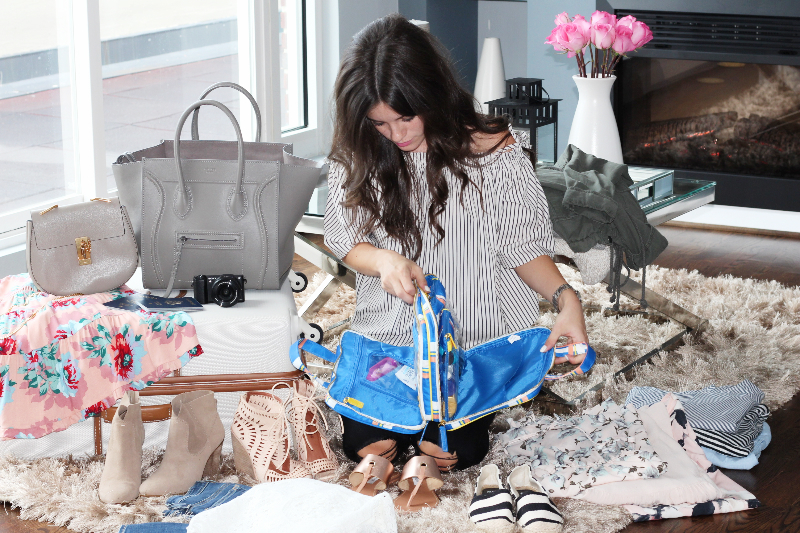 My trick is to pack neutral shoes because they will go with everything you pack! I packed my favorite Jeffery Campbell wedges because they can be dressed up or down & are comfy. 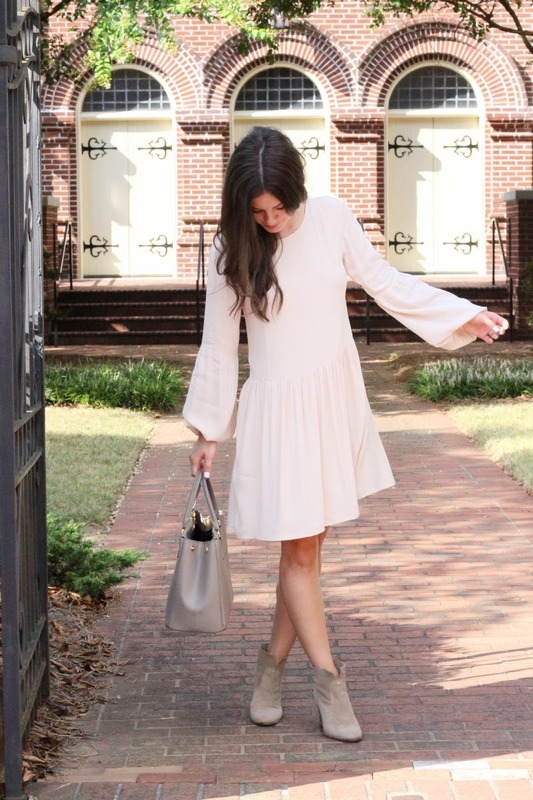 They will go with everything including the dress I am wearing to the wedding I wrote about in THIS post and whatever more dressed up outfit I put together if we go out or anything. I am also taking a pair of booties (not sure which ones yet but love THESE in the pics above), THESE sandals (& two or three in case one breaks and I mean a girl's gotta have options! 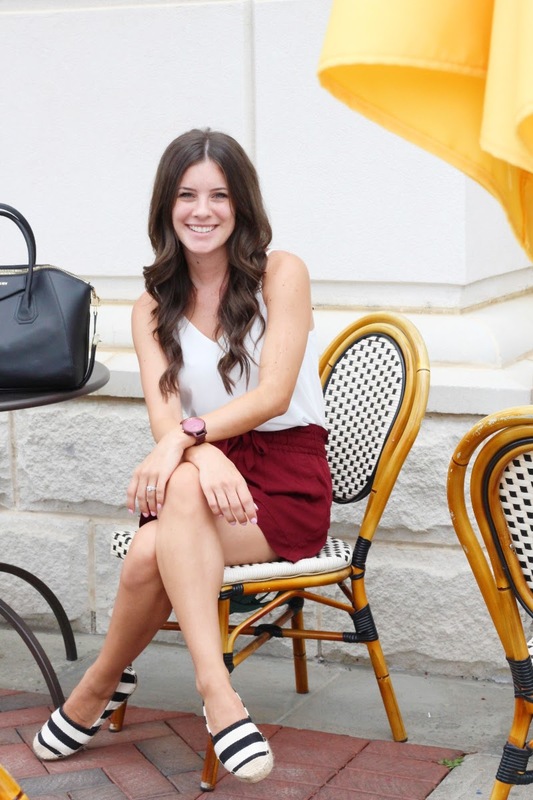 ), closed toe flats (love THESE striped ones above for $18 that I styled in THIS post), and sneakers (definitely packing THESE beauties that are currently one sale). You have probably heard people say pack light and don't pack things that wrinkle easily. I have to steam most of the clothes I buy on the regular and we all know by know that my suitcases take up every ounce the airport allows so those two tips are hard for me to follow. A few packing tips I tried that work to make the most of your space and keep clothes looking fresh is laying clothes on top of each other and folding them together as if they were one piece or rolling them (I do this by folding an individual piece normally and then rolling it). If you are careful when you fold/roll to make sure there are no wrinkles there won't be any when you unpack at your destination. I have tried both of these tactics and it works while saving a lot of space. One thing though is make sure that you use the buckle inside the suitcase and tighten it so your clothes can't move around in transit. THIS post on Pinterest is great and has tons of packing hacks to help save space. It also gives you pictures of what I was talking about with folding above. Another way I get rid of wrinkles is unpacking as soon as I get to my destination. Most of the small wrinkles that developed will usually disappear if you hang them overnight. Also, it can make it easier to get dressed because you see everything you brought with you. Two things that I will try this trip that I have never tried before is packing my delicate clothes in a dry cleaners bag (someone gave me this tip on IG and they go into more detail in the post above & it sounds genius!). Also I bought this wrinkle-free spray. Most of the reviews sounded like it worked miracles so I am curious to try it. Anyone else try it? I will definitly let you all know how it goes! If you follow me on Instagram I posted a photo of a few suitcases that I had trouble picking between. My husband and I have taken tons of trips within the last about three years we've been married and have been through maybe four suitcases so I thought it was time to invest in a good one. I ended up going with the Delsey Chatelet 28" Spinner in champagne after reading some reviews and hearing from you all that have & love it! I remember seeing this luggage a long time ago and closed the tab as fast as I opened it after seeing the price tag. It is on MAJOR sale right now & has ten year warranty! I still cannot believe the deal I got for the features included in this luggage. I love that it has a TSA safe lock code (makes me feel at ease traveling through different countries). One thing it does not have is outside pockets but it does have very deep spaces on the top and bottom sections with many different compartments, buckles, zippers, and bags so really you have twice the space a luggage with outside pockets has. This also comes in brown (and black at THIS site), but I loved the white and after hearing from people that it is easy to clean off, I was sold. Since this trip is lengthy, I will also be taking a carry on luggage with me in case our luggages get lost with an outfit or two and some necessities just in case. I also have been using my Celine luggage tote the past few trips. It is basically a huge hole with handles that fits everything I need, but still the perfect size to fit under my feet on the plane. I definitely recommend taking a big bag to travel with. I am also taking my Chloe drew bag ($25 dupe HERE, insanely similar!) because it is the perfect size to walk around town in and is neutral so it goes with all of my outfits. I also have a ton of little pouches and bags to keep different items and products separated and organized. One of my favorites is THIS wash & wear pouch! It is so useful to keep my clean/dirty undergarments separated and is on sale! The biggest nightmare here is bringing your expensive electronics, including hair tools, just to plug them in and have them burn out! (It has happened to me and was totally bummed)! Now, I am absolutely no expert in this category but hopefully this will guide you. Make sure you get universal travel power converters like THIS one depending where you are traveling. Also, make sure they are ones that do not limit the amount of time you use it and enough to have for multiple plugins if needed for convenience. As far as hair tools, make sure they are also universal. I bought this T3 straightener that I actually used to curl my hair in these photos that specifically says "world voltage" and "multi voltage." I also saw ones that allow you to change the voltage with a switch before you plug it in. I also love traveling with this Sony camera because it is small and still takes amazing quality pictures and videos. I have done quite a bit of research before I bought it and was surprised how much I loved it. To get an idea of the quality of pictures with this camera I used it for several of my posts including THIS post and THIS post. Almost everything I use or can get away for this trip comes in travel size! I loaded up on travel size items because so much of travel weight can come from all your liquids. 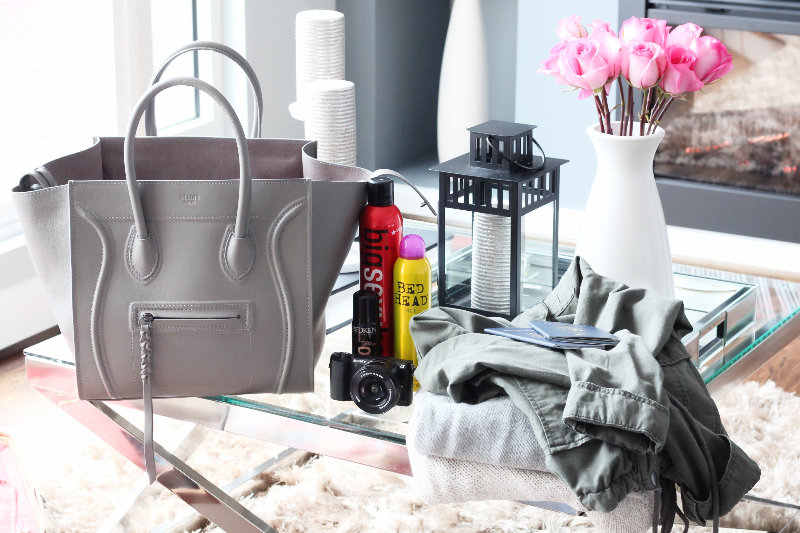 From experience I can't travel size my hairspray or dry shampoo (haha!) but I found everything else including this It's a 10 Miracle Leave in Conditioner with Keratin in travel size so I was super excited about it. I also bought this new beauty bag because of its function. It has multiple pockets, pouches and zippers to keep everything neat and organized. I especially love the two clear pouches with velcro at the back because it keeps all the liquids in one pouch were they to pop open and they are removable in case I don't need to take the whole bag with me for any reason. I hope this post was somewhat helpful & again, thank you all for sharing your travel tips & luggage choices/reviews on my Instagram! I would love to hear if you have tried any of these tips or have ones I didn't mention in the comments section! XO! I have been looking for a dress to wear to a "garden" wedding I am going to in Europe. I always try to pick my wedding outfit based on the color scheme, location, and of course formality of the wedding. 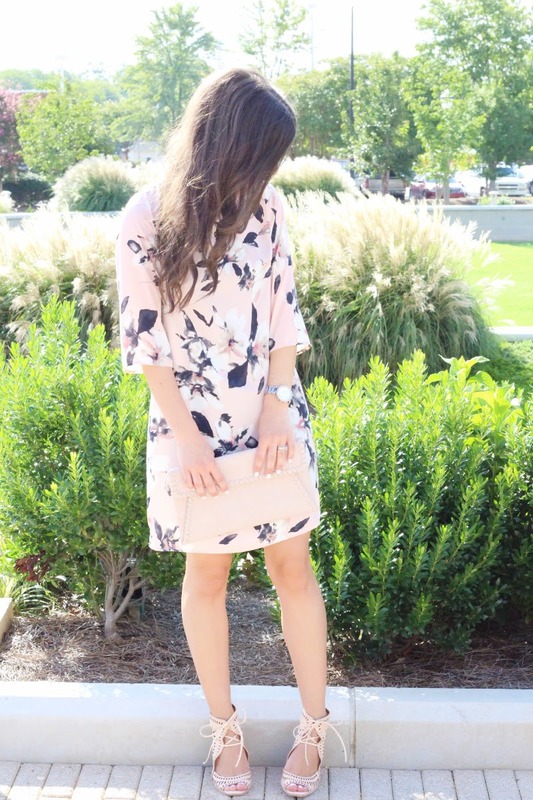 The floral print and color scheme in this dress seemed perfect for this particular wedding. I paired it with these wedges because they are so comfortable so they won't give my feet a hard time wearing them all day. Also, the reception is outdoors so wedges are always a go-to if I have to walk through the grass, etc. As you can probably tell in the photos, I am not in Europe lol! I have been buying a few things from Shop Stevie lately and I have noticed many things I have purchased sold out quickly, so I wanted to post this dress early in case some of you want it while it is still in stock. Now total disclaimer.... knowing me, I change my mind a million times especially when it comes to outfits so don't be surprised if you see pics from the wedding and I am not in this dress haha! We are leaving Tuesday and I am going to the mall today to grab a few things and hopefully start packing, so I may or may not find something else that catches my eye! Fall is right around the corner! 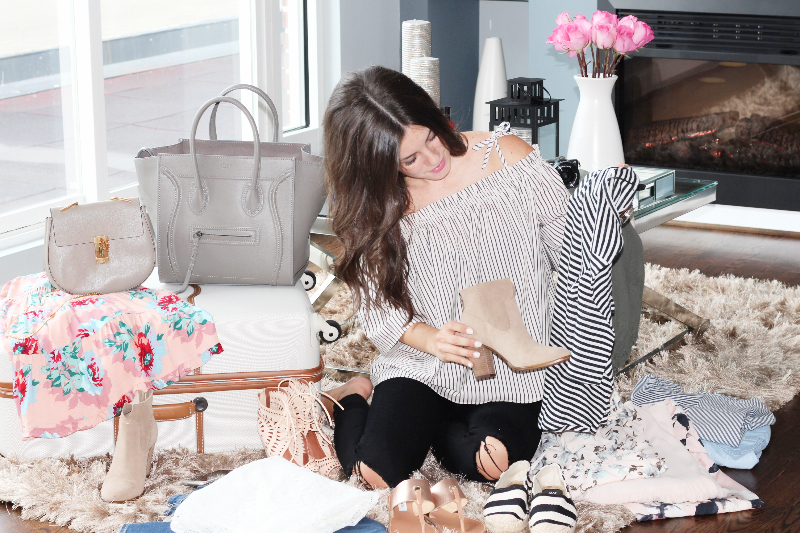 But, you don't need to toss all your summer dresses and empty your bank account to fill your closet with new fall clothes. This summer dress for example was perfect for summer nights with strappy wedges or sandals. Add booties, a hat and a blanket scarf and you're good to go for fall! 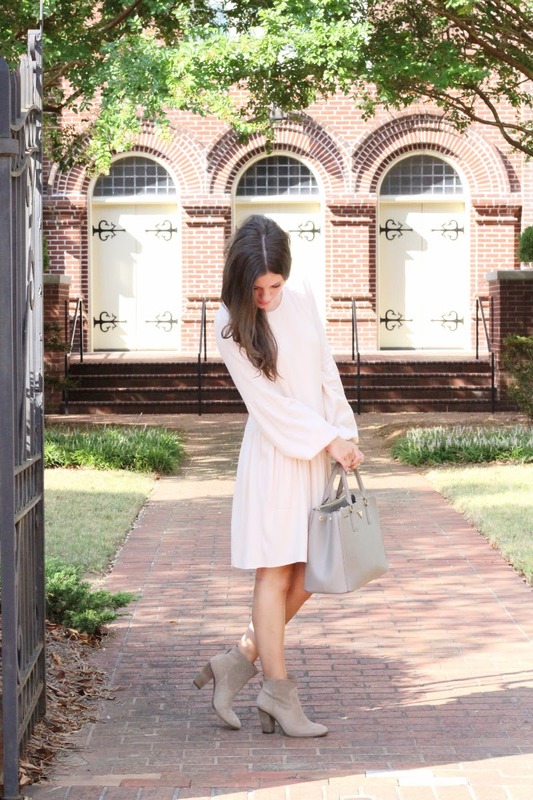 It can easily be transitioned into fall with booties. Fall is one of my favorite seasons for fashion because you can easily add layers to a simple outfit with a scarf or cardigan and it can completely change the look! 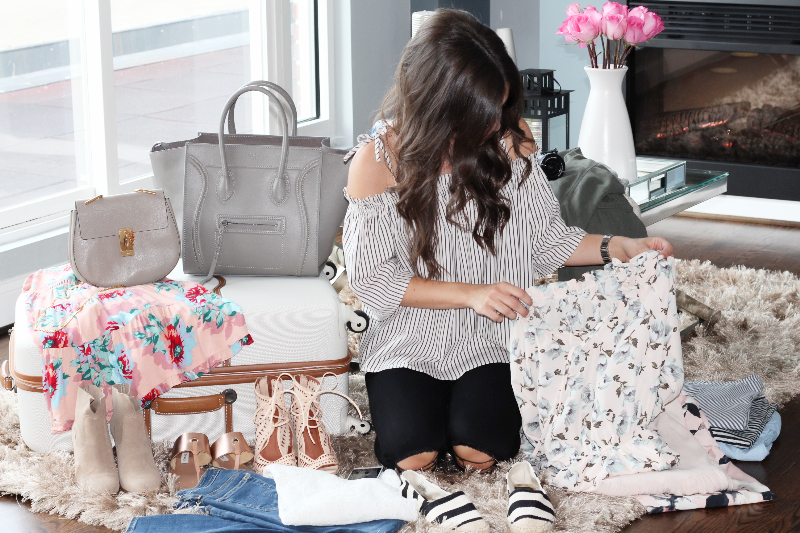 If you missed THIS POST, I used one summer dress and styled it 5 different ways to be worn all year round. Check it out! XO! 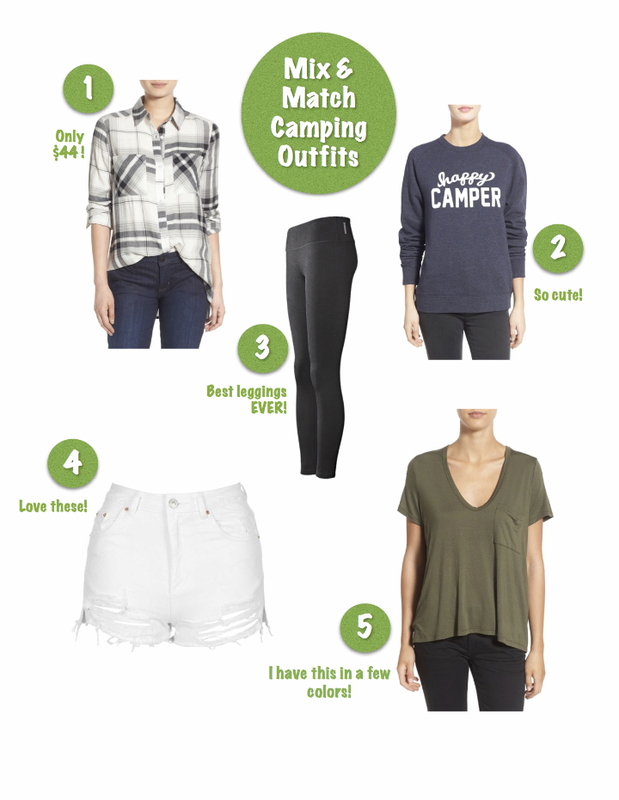 In honor of going camping this weekend, I decided to round up five camping essentials that can be mixed and matched. I wear the crown of over-packing so I decided to look for pieces of clothing that can be worn a few different ways together. For example the v-neck can be worn with the leggings (Which by the way are worth every penny! They will last you forever!) or with the white shorts or with either and the plaid shirt layered unbuttoned on top or tied around the waist. Also the "happy camper" sweater (I mean how much more perfect for the occasion can it be?!) can be worn with the leggings or shorts depending on how chilly it is. Really the combos are endless! What are you all up to this weekend?! I'm excited to get some fresh cooler air, and eat all the s'mores my belly can hold! I think this is one of the first times I have worn high-waisted shorts, and I am in love. I love the cute ruffle detail and bow at the top. I also love the length because I can wear them with wedges without them looking too short. I linked the black version above; this color is sold out online. I did check two different h&ms and they both had them in stock in store if you are really wanting this color. I have also been searching for espadrilles for the longest time. I found these striped ones and fell in love. They are true to size and are so comfortable. I was expecting them to blister, but I had no problems wearing them out for the first time. Also, they are on sale online for $18!! I bought them in store for $30 and checked their stock online right after and wished I had ordered them online instead haha! If you are following me on Instagram, you may have noticed me obsessing over this JORD watch. It is made of real wood and is the prettiest plum color! It goes with almost every outfit and you can wear it year long. They also have other styles to choose from. You can shop more woman's watches here and their men's collection here. Now, onto the GIVEAWAY! You can win $75 towards a JORD watch and just for entering everyone else automatically gets $20 off a JORD purchase, so everyone wins! The giveaway starts today and runs until 8/21. You can enter the giveaway HERE. Good Luck! XO!